AKS Clinic is a one-stop center for all your dermatology and cosmetology issues. At AKS Clinic, we have expert dermatologists to take care of all your skin related problems. AKS Skin Clinc in Gurgaon employs the latest technologies in skin care and skin treatment at its state-of-the art center in Sushant Lok I, Gurgaon. The most common skin problem includes the following. It's important to pay attention to the health of your skin, hair, and nails so you can prevent problems like an ingrown nail, a rash, or a life-threatening problem like melanoma (skin cancer). Nail diseases include deformity of nails and infection or inflammatory diseases of nails and side effect of systemic drugs. Nail diseases usually respond slowly to treatment so persistence with the treatment and patience is necessary. At AKS clinic, we follow careful treatment procedures to relieve you permanently from nail diseases.All Skin diseases are treated at AKS .It requires well balance combination of medicine and cosmetic care. Acne It is a common skin issue mainly suffered by adolescents. It is common in people with oily skin and hormonal imbalance and it requires well balanced combination of medical and cosmetic care. AKS Skin Clinc’s skin treatment expertise offers you advanced solutions for taking care of acne problems with safe and clinically proven methods. Skin Pigmentation is the common problem. It is the appearance of dark patches on the skin. It can be managed well with medical and aesthetic treatment depending on the cause of pigmentation. Skin treatment experts at AKS skin clinic would study your skin type and offer best solutions for your skin type. Vitiligo vulgaris We also treat vitligo disease that arise due to non functioning of melanocytes and cause irregular white patches on the affected areas. It can be treated with medical or surgical treatment depending on the stability of the diseases. “Beauty is not age bound ” and this is what people from the later walks of life have come to believe today. Today because of new age technology and rapid development in the field of cosmetology, dermatology and aesthetics, youthful looks can be maintained at any age. 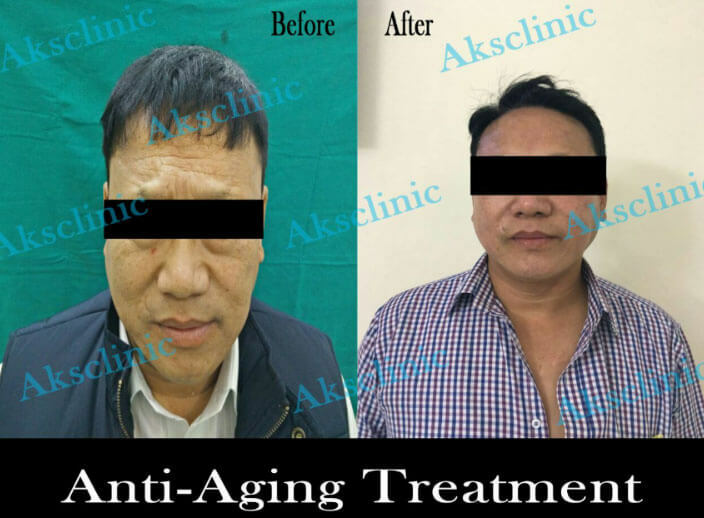 AKS clinic at gurgaon provides most effective anti ageing treatments like photofacial, skin tightening, Botox, fillers which give youthful and beautiful look. These treatment ensures complete relief from ageing skin woes. It helps to rejuvenate, revitalize and repair the skin to make it look beautiful and forever young. Photofacial treatments can be used to restore the skin’s youthful appearance of photoaged skin, removes age spots ,sun induced freckles, most benign brown pigments and redness caused by broken capillaries through a process called photo rejuvenation for face and body. In this a broad spectrum of light is transmitted through a small, transparent hand piece which is gently placed over the skin. The Cut-off filters in the hand piece change the wavelength range allowing it to be optimized for different application and skin types. The light penetrated the tissue and is absorbed either by the blood when treating vascular lesions or the melanin when treating pigmented lesions damaging them. The other easiest and quickest solution to wrinkles is BOTOX. A Non Surgical easiest and quickest solution to wrinkles is BOTOX. A non-surgical, doctor-administered treatment that can temporarily smooth out mild to moderate forehead lines, frown lines, crows feet and a lined neck amongst other areas, it is the only therapy of its kind that is approved by the US FDA. The treatment of choice to rectify lines and wrinkles. The injection relaxes the muscle, thus reducing the associated lines and wrinkles, giving the face a fresh, rejuvenated look. Our panel of expert doctors are trained to inject the right quantity of BOTOX which ensures the results are as natural looking as possible. The treatment involves no downtime and depending on the size of the area treated, results become visible in 3-7 days. The therapy can be repeated every 6-8 months. Today, BOTOX is also used for facial enhancement such as jaw contouring to give the face a chiseled look and to remove the appearance of a gummy smile. Dermal fillers are cosmetic procedures that help in restoring the youthfulness of the face and can be used to correct fine lines, wrinkles, creases, dark circles, volume loss and facial sagging. At AKS doctors have extensive experience with Dermal Fillers and it takes just an hour to walk out looking younger and refreshed – you will still look like you, just a better you! AKS Clinic also handles cosmetic dermatology treatments like chemical peels and Microdermabrasion (MDA). A Chemical Peel is the least invasive procedure that is used to improve your skin texture. The upper layer of your skin gets damaged by sun exposure, acne, or age, which leaves your skin tone uneven, spotted, scarred or wrinkled. A Chemical Peel helps to improve scars, freckles, irregular skin pigmentation, rough skin and scaly patches, sun damaged skin, age and liver spots etc. Post peel, patients feel a tightening and smoothness of their skin. Approximately 5-6 sessions of peeling with 2 weeks interval is required for desirable outcome. MDA popularly known as skin polishing. Microdermabrasion has long become a brand name in aesthetic treatments and is the world’s one of common aesthetic procedure which can be combined with various other modalities to get desired outcome. It is a minimally invasive mechanical exfoliation procedure for superficial skin resurfacing. Most exfoliation modalities in use today can be broadly classified as chemical exfoliants, which include glycolic and salicylic acid peels and mechanical exfoliants. The depth of resurfacing achieved with MDA is conservatively in the middle of this spectrum. Although MDA exfoliation can vary from superficial thinning of the stratum corneum to penetration into the upper papillary dermis, the target depth for most MDA procedures is removal of the stratum corneum. Since microdermabrasion is based on mechanical exfoliation, the results are immediately visible after the first treatment, making way for smooth, softer skin and a refreshed complexion.